As an Indonesian, I love hot food with strong taste. I would say I like Thai food as much as I do Indonesian food. 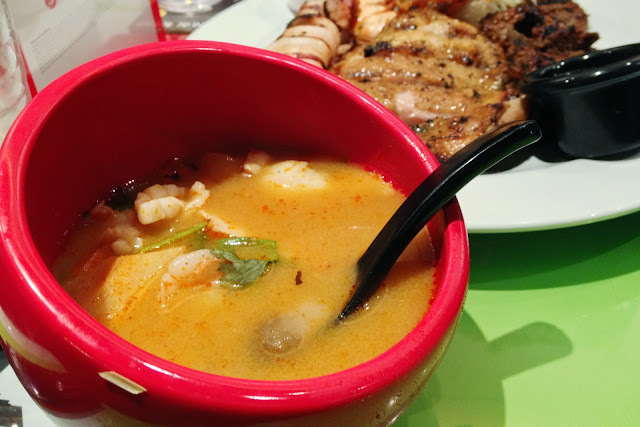 I have eaten tons of good authentic Thai food in Minneapolis and Saint Paul thanks to the vast number of Thai community in the Twin Cities, although honestly speaking the taste would've been even better if the sugar can be cut down. Backed in Singapore, I came across Bangkok Jam when I visited JEM shopping mall for the first time. I had the impression that Bangkok Jam is Thai Express kinda Thai chain restaurant, so I did not expect much - nor did I have the intention to go in and try the food. From their website, they stated that Bangkok Jam is a fusion restaurant that combines western hint and pan-Asian spices into the Thai food. (And by the way, the jam really stands for traffic congestion). Recently, I celebrated my friend's early birthday party by having a dinner together at JEM, and since I suggested Thai food, my friend said we should try Bangkok Jam. The ambient of the restaurant was not bad. It was packed when we were there but I did not feel that it was too overwhelming. We ordered the Bangkok Mixed Grill ($23), the Thai Olive Fried Rice ($11) which was recommended by our server, and the Seafood in Red Tom Yum Soup ($7.90). 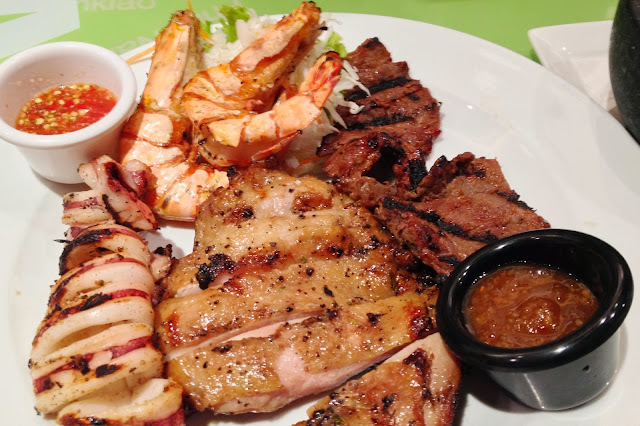 The Bangkok Mixed Grill consists of grilled chicken, beef, squid, and shrimp. The chicken was fantastic - crispy and perfectly glazed skin with nice burnt aroma, though some hairs were still left unplucked. The squid and and shrimp were also tasty and nicely done. The only miss of the dish was the beef, which was slightly overcooked but very well marinated. Two thumbs up for the platter. As for the Red Tom Yum soup, I would say skip it. Nothing was really special and the seafood was a little bit bland. 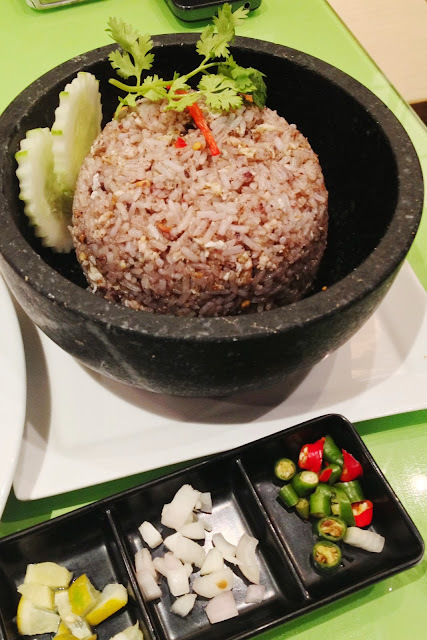 The Thai Olive Fried Rice had bits of minced pork, and it tasted fragrant and rich. We were very full and not able to finish the fried rice. The leftover was more than half and I asked for a box. The server was slightly confused and I guess I might be the only person asking for a box for my food in Singapore. We also ordered dessert. My friend wanted the Mango Sticky Rice but the mango was sold out, so we ordered the Caramelized Tapioca with Coconut Milk ($7.50), which I did not managed to take a photo. The dessert was really impressive. The tapioca was cooked perfectly, soft, and sweet. The coconut milk tasted good and did not taste like it came from a box. Overall, my dining experience was quite pleasant. I was actually quite surprised of the negative reviews about the restaurant, although I would have to agree that the service was kind of slow and unresponsive. 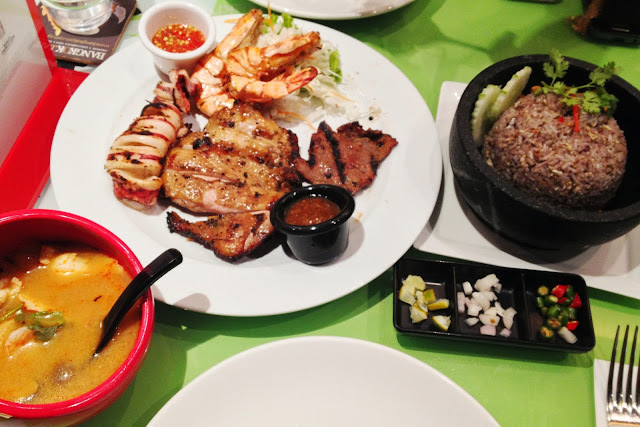 Overall, if you are looking for authentic and traditional tasting Thai food, Bangkok Jam might not satisfy your cravings. (Which was why the Tom Yum was more beyond ordinary). Nevertheless, Bangkok Jam delivers taste that are strong and prominent, that are able to satisfy at least my tastebud.